I'm long overdue to review this album, and I apologize for those who were waiting for a review of the new Axxis. Being a huge fan of this band from day 1, I always highly anticipate any new material this band releases. I can still remember when my brother came home with the vynil of Axxis debut (Kingdom Of The Night) album, handing it to me and telling me it was a gift and that I would love this band. He was right on the money, I fell in love with Axxis from the first listen and my love for this band is today still as strong as it was in those days. Thanks again bro for that great gift you made to me back in 1989. Well 17 years later Bernie still hasn't lost his incredible and unique voice, and Axxis still has a lot to offer to the melodic metal category. This band pretty much opened (with their first 2 albums) the road to the Power Metal explosion that came later in the mid-nineties. And today they still fly with ease in this category. This album is, for the lack of a better word : killer ! Leaving right where Time Machine left us, with even more melody, power and majesty than one could ask for. The album starts with a solid song called Dance with The Dead which features additional female vocals, adding a pinch of Nightwish to the Axxis magic potion. While I don't mind the new vocals, I find them almost unnecessary, since Bernie has such strong, unique and amazing vocals. But its maybe to fulfill a trend with female vocals, who knows... Like I said I don't mind them (they're actually quite nice), but they don't make a difference here and if they were suppressed from the songs, these wouldn't lose anything. Next comes Tales of Glory Highland which will forever stay carved in my memory, and yours too I'm sure. A killer of killers fast paced song and an instant Axxis classic for sure, in the vein of Eyes Of Darkness. The riffs in this song remind me the old days while the amazing production and powerful sound brings Axxis to new heights ! My favorite song of 2006 for now, and oh joy, the limited first edition of the album comes with a long version of this song ! Next comes Take My Hand, a song that contains lots of the new female vocals, and while not being a huge fan of them I must admit that on that song they work like a glove. The new female vocals of Lankonia aren't on all songs, just a selected few over the course of the album, and if Axxis decides to keep them in their next albums : I just hope it stays within this proportion (one song here and there). The album continues with one killer song after the other, up until the 12th song, a rock-like song like Axxis knows how to deliver. Not afraid to come back to the roots of what we call metal today (rock !). If you like fast songs then songs like Talisman, Icewind, Passion For Rock and of course both the opener Dance With The Dead and Tales Of Glory Highland will quench your thirst. But Axxis also delivers killer mid-tempos tracks like Gods of Rain, Lady Moon & Stay By Me. Not to forget the ballad, Don't Leave Me, very emotional ballad and very nice duet. Instrumentally this new Axxis album sounds a lot like the previous one : killer guitar riffs, melodies and amazing solos. Excellent use of keyboards that totally blend with the guitars to add majesty to the songs, and a solid rhythm section, with pounding double bass drums when needed (something the old time Axxis never had and that is a welcomed addition). The limited first edition contains 2 bonus track and other bonuses (a video), as mentionned before, a long-version of Tales Of Glory Highland, and also another bonus song called Break Your Soul, which is a cool fast-paced song. If like me you're a big fan of the band you'll definitely go toward the special edition, otherwise the normal edition of the CD with 12 songs should satisfy most of you. 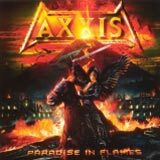 Paradise In Flames is simply the best Axxis album since their debut ! I couldn't believe my ears when I listened to it and it still gives me shivers when I listen to it now, even after so many listens. Frankly I didn't think they could top Time Machine, but I was obviously wrong. I'm sorry I didn't review this gem sooner, mea culpa. 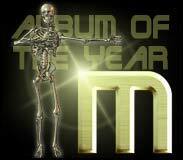 Without a shadow of a doubt one of 2006 best albums. If you already know and like Axxis, then you can buy this album blindly, if not, and you're a fan of melodic and majestic power metal, then I suggest you discover Axxis with this amazing album. Personnaly I can't wait to listen to what's coming next ! Only good things I'm sure... To conclude I'd say that if you must buy only one album in 2006, then I definitely recommend you Paradise In Flames.